Identifying complex mutations in the structure of an organism's genome has been difficult. But in a new study published online in Nature Genetics, a research team led by J.J. Emerson, assistant professor of ecology & evolutionary biology at the Ayala School of Biological Sciences, applies new methods of genome analysis to identify these complex mutations with unprecedented resolution. Their approach identifies extensive genetic variation in the fruit fly genome that have previously escaped discovery. Their results will help push researchers closer to understanding how complex mutations in genomes drive disease and evolution. "For the first time in animals, we have assembled a high-quality genome, permitting the discovery of all the genetic differences between two individuals within a species," said Mahul Chakraborty, a postdoctoral scholar in the Emerson laboratory and first author on the study. "We uncovered a vast amount of hidden genetic variation during our analyses, much of which affects important traits within the common fruit fly, D. melanogaster." Unlike standard approaches that rely on the same sequencing technology that delivered the so-called $1,000 genome, the team's approach relies on reconstructing the whole genome from a newer technology that is capable of reading much larger pieces of the genome. The use of such long molecule sequencing equipped Chakraborty and Emerson to unravel complex changes that alter the structure of the genome. "This study is the first of its kind in complex organisms like the fruit fly. With this unique resource in hand, we have already characterized several candidate structural variation which show evidence for phenotypic adaptation, which can function to drive species evolution," said Emerson. 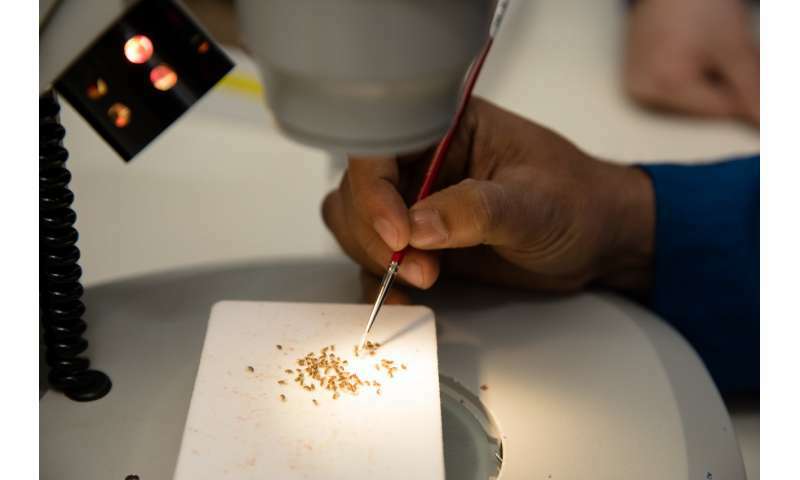 In exploring how some of these newly identified structural genome changes might contribute to fruit fly evolution, the group were drawn to an enzyme family that has been associated with resistance to pesticides and cold preference, among many other functions. They found that structural changes crank up the output of one of the genes by 50-fold, suggesting how such flies attain increased nicotine resistance. According to the researchers, the fact that so much variation escaped notice in D. melanogaster - a species with relatively simple genomes less like to hide variation - suggests that our own genomes, and those of the species we eat, are harboring an even larger store of medically and agriculturally important genetic variation. Not just the dna sequence. it is the arrangement of that chain (ie; histone placement) that also effects the total system.